Hello Ladies! I hope your all having a fab weekend, whatever your up to! Last night I was lucky enough to get tickets to see the Britain's Got Talent auditions! I had a great time and I can't wait to see some of the auditions on TV when the show comes on! I've never really been into body care that much, but recently my fake tan just hasn't been looking as great as it used to, and nobody likes a patchy tan. So I decided it was time to get a good scrub and moisturiser and a lot of you recommended Soap & Glory. I've never really been a huge Soap & Glory fan after a bad experience with their 'Some Like It Hot' scrub/body wash, but once again I was drawn in by the girly-ness of the brand. 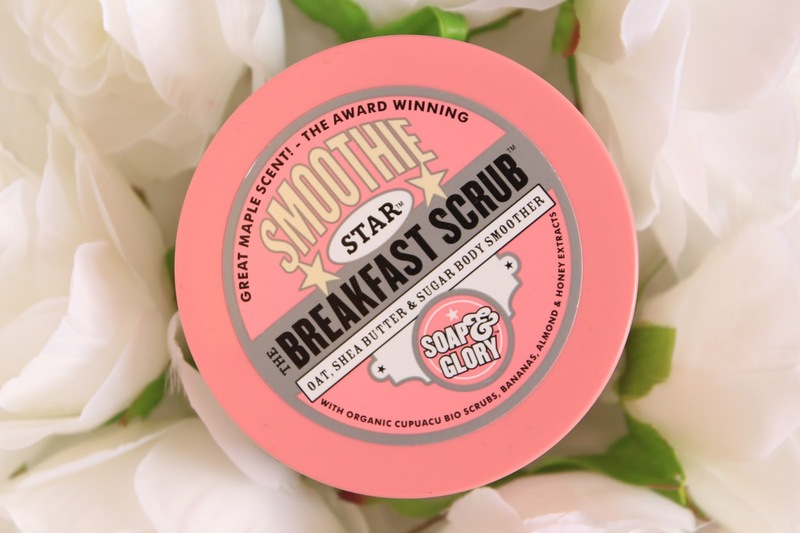 Soap & Glory is currently on 3 for 2 in Boots so I picked up two scrubs and a moisturizer for after I'd used the scrub, and the first thing I've got round to trying is 'The Breakfast Scrub' from their Smoothie range. Now this wouldn't be a Soap & Glory review without at least giving the packaging a little mention. Like all Soap & Glory products, this has the girly pink and vintage style packaging which I adore. This scrub looks so pretty sitting on the side of my bath and the packaging really does make me want to use it even more than I already would. This comes in their standard tub packaging like the majority of their scrubs so it's not brilliant for travelling but this doesn't really bother me as I could just scoop some into a smaller pot when I'm going away. 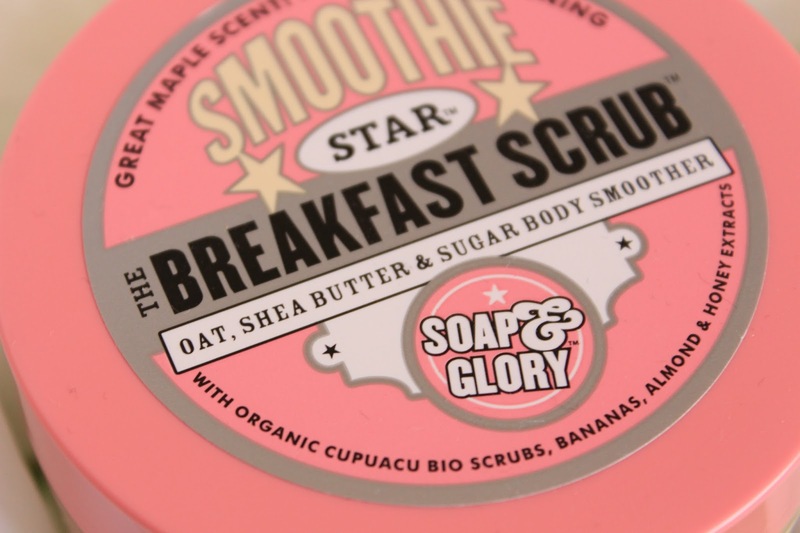 Like I said, The Breakfast Scrub is part of their Smoothie line of products so comes with a matching moisturiser, which I also picked up but I won't say too much about that as I will be reviewing it separately. 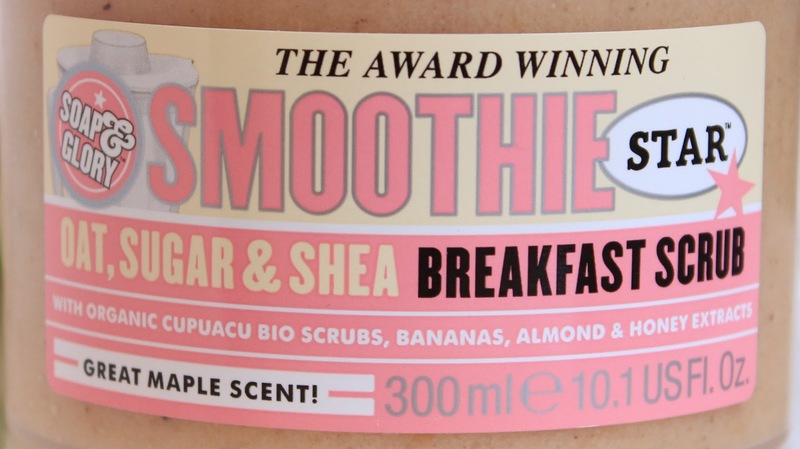 The Breakfast Scrub contains oats, sugar and shea along with organic cupuacu bio scrubs, bananas, almond and honey extract which makes for the yummiest smell I've ever smelt. This scrub smells exactly like maple syrup and reminds me so much of eating pancakes in an American diner. This smells seriously good, and that alone has made this product easily my favourite body product. I'm quite particular with my body scrubs as I like them to be abrasive enough so it actually feels like it's doing something, but not so abrasive that I feel like I have no skin left after using it. I think Soap & Glory have got it just right with this scrub as you can really feel it working on your skin, but my skin still feels smooth and soft afterwards, so it doesn't completely dry your skin out or leave it over exfoliated. The consistency is a bit sticky at first, probably due to the honey, but it soon turns into an easy to work with, milky formula. I really couldn't reccomend this scrub enough, and even if you don't want to purchase it, you need to get down to your local Boots store just to give it a whiff, it smells seriously divine! The Breakfast Scrub costs £8.50 from Boots but Soap & Glory is usually on 3 for 2 so you could get it for free if you had other products you also wanted to try from their range. 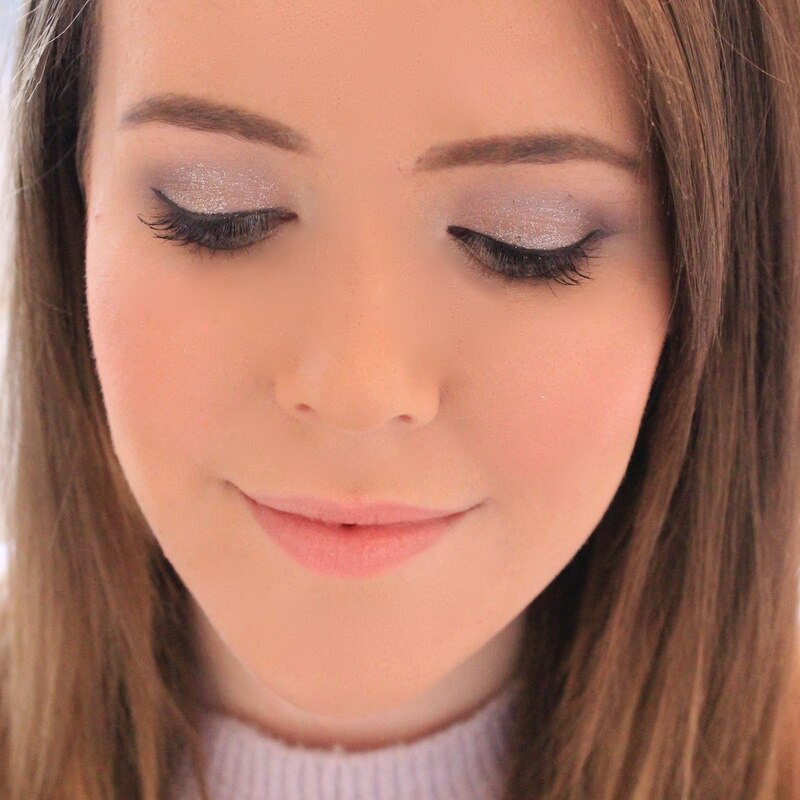 I've loved Soap & Glory since first discovering them a few years ago! Unfortunately in Canada it's not available in many places, and it's more expensive - and we don't get the 3 for 2 deal! It all smells incredible though, and I just want to buy everything! Great review, girly! I may have to pick up this scrub because it sounds divine. Okay, I just love their products. They are a little bit harder to find where I live, but whenever I come across them, I stock up! This sounds great. Amazing review, you've literally covered everything here - and I agree with you completely, this scrub is incredible! The smell of it gets me everytime and I find myself repurchasing again and again. In fact, there isn't anything that has disappointed me with any S&G products, they're just generally great as a brand! I'm definitely going to try this out at some point. It sounds fantastic! I'm particular about scrubs too, I hate it when they're too delicate and I feel like it's doing nothing for my skin. Great review! This is one of my all time favourite scrubs without a doubt. I've tried others but they don't match up at all.